The reality show Face Off, now in its 9th season, has the undoubted merit of having brought the world of special effects and creature making to the attention of a much larger audience. While the show hardly focuses on any given technical aspect, it has contributed to make another thing clear for the masses: airbrushing is a fundamental skill in the creation of special effects makeup. The uninitiated who wants to tackle FX and creature making, but isn't ready or able to enroll in a professional school is left with one big question: is there another readily accessible, fairly priced, and above all reputable source of training and information? The answer is yes, yes, and and even bigger YES. The source exists and it is called "Stan Winston School of Character Arts". Founded by the Winston family in honor of their legendary patriarch, the "School" is not a physical place, but a subscription base website with a wonderful core principle: offering comprehensive, detailed training in the form of professionally filmed web courses held by some of the very best in this field. Every aspect and technique related to special effects makeup and creature making is discussed and explained in depth: from mold making to animatronics and everything in between. I was a subscriber of the school myself for several months, and what follows here is a brief account of my experience, and a little guide to the courses that focus on my passion, which is of course airbrushing. As always these are my genuine, unsponsored opinions. How it works: no catches! I always approach subscribing to anything online with great caution, after I was scorched a long time ago by a bad experience with a web service offering "auto renewal". 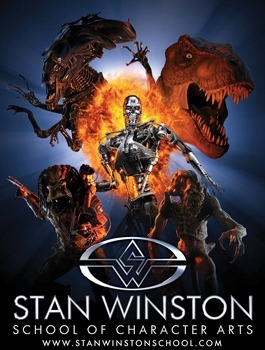 The Stan Winston School Website offers an incredible, unlimited 3 day free trial that is jut that: three days of unlimited access to its contents. This means you can watch as many courses as you like, and really get a feel of what the contents are like. You can cancel your trial at any time after it started. If you do so, you will not be billed anything, and you will still be able to enjoy your full three days. I am writing this because it is not repeated too often during the subscription process, but you can rest assured that the School is a highly ethical enterprise, and it is in no way out to defraud you of anything. If you decide that you want to continue with your subscription, you will simply let it run and it will turn into a regular subscription at the end of the trial. There is no minimum subscription requirement, this means you can cancel any time before the next monthly renewal and your subscription will end with the current month (or year, if you selected the annual plan). There are three levels of membership: Apprentice gives you 4 tutorials on demand per month for a low price, meaning you can select up to 4 courses and watch them all or in part. At the beginning each month your total will be zeroed and if you want to finish watching a course you had started in the previous month, this will be counted against your month's 4 total. "Monthly" and "Annual" give you unlimited tutorials. If you don't wish to subscribe at all, but are interested only in watching and keeping selected courses forever, you can also buy each webcourse in streaming or DVD format. It is always a good idea to subscribe to the school's newsletter to receive limited time offers and special promotions. The content of the website is divided in Live Web Courses and On Demand Web Courses. This is self explanatory. What you may not be prepared for is the fact that these are true seminars broadcast in real time, so the live sessions last anywhere from two to seven hours or more, with technical breaks and pauses, and moments dedicated to live interaction with on line students. The On Demand versions of the web courses are slightly edited, and of course no live interaction is possible, but you can always ask a question in each course's page and you will receive an answer, often by the teachers themselves. With a lot of courses lasting over six hours I found my Apprentice membership more than enough, and in some months I wasn't able to watch more than a couple. The teachers are all amazing. We are talking the very best in their field, including many Academy Award and Emmy winners. I expected them to be knowledgeable ad passionate, but I wasn't prepared for how entertaining they all were. Almost each course is enriched with anecdotes, personal stories and fun tidbits that made learning really fun. If you are new to airbrushing and want to learn it as a tool toward the creation of special effects, this by far one of the best places you could visit. -How To Airbrush by Craig Fraser. This is the best place to start learning about airbrushing from a true master who is not only incredibly passionate and informative, but also seriously entertaining. This course is all about introducing basic airbrush painting techniques that are the foundation for any subsequent application. Tools, materials and sources are all discussed in details. Six hours will just fly! -Hyper Realistic Silicone Painting Techniques by Tim Gore Another exceptional artist guides you through the rather complicated process of painting on silicone. After a somewhat shy opening, Tim warms up and draws you into his passion sharing a world of useful tips, and a treasure of knowledge on what materials to use and how to make them or purchase them. While the subject material is silicone, the layering techniques shown here are fundamental for reproducing realistic skin tones on any kind of material. -Zombie Makeup by Bill Corso This course shows very practical uses of airbrushing in creating a zombie makeup. Once again you will be able to decline the techniques you learned here into a variety of different applications. This is actually the second part of a very extensive workshop by Oscar winner Bill Corso, and I definitely suggest watching the whole thing, even though not strictly airbrush related, to get a sense of how a makeup for film is created from concept to screen test. -Airbrush Veining Technique mini tutorial by Steve Wang The amazing Steve Wang takes you through the process of creating veining effects with an airbrush. This is a basic technique that you will be able to use in a myriad of projects, taking full advantage of the potential of your airbrush versus slower traditional methods. Paiting Silicone Skin-Realistic Flesh Tones by Jamie S. Grove Antother in depth tutorial by another amazing teacher, who will illustrate all the techniques and materials used to create an ultra realistic skin texture on silicone. The methods shown will of course apply to any other material, provided you are using the appropriate paints. The Garage Monster's Guide to Airbrushes mini tutorial by Shannon Shea This mini tutorial focuses specifically on equipment. While all the other teachers describe their preferred tools in depth in all the other tutorial, it is good to have a further opinion by the great Shannon Shea on what prioritize in your shopping list. mi piacerebbe imparare ad utilizzare questo strumento..